Love them or hate them, Porgs have absolutely dominated the conversation surrounding Star Wars 8 ever since the adorable alien birds were revealed. We haven't even seen the little creatures in action yet, but they have captured the imagination of Star Wars fans and have already cemented themselves as something that we will be talking about long after The Last Jedi hits theaters. Now, director Rian Johnson has taken to social media in order to share some more Porg facts with us. A fan recently reached out to Rian Johnson on Twitter asking for some new info on the Porgs, since he was having a bit of a "depressive episode." Johnson, who very regularly engages with fans without spoiling too much, was happy to oblige and gave us a little better understanding of what to expect from the Porgs in Star Wars: The Last Jedi. Here's what he had to say. "They are sea birds. Their coloring varies. Males are slightly larger than females. They can fly short distances. They're inquisitive." It was revealed previously that the Porgs are native to Ahch-To, which his where Luke has been hiding out, as revealed in the final scene of Star Wars: The Force Awakens. The official description of the creature on StarWas.com states that Porgs are "Small, flat-muzzled avians that flock about the rocks and roost in the cliffs of Luke Skywalker's secluded island, porgs are inquisitive creatures." So Rian Johnson saying they are inquisitive isn't necessarily a revelation. But knowing that we will see different colored Porgs and that their size varies based on gender is pretty interesting. That should give Lucasfilm plenty more merchandising opportunities down the road. It is actually pretty amazing how much conversation has surrounding the Porgs ever since their reveal. This is going to be the first Star Wars movie since Return of the Jedi that Luke Skywalker actually speaks in, as well as the last movie in the franchise to feature Carrie Fisher as Princess Leia, in addition to plenty of other things for fans to look forward to. Yet, it is these cute little seabirds that have grabbed hold of the internet in a big way. 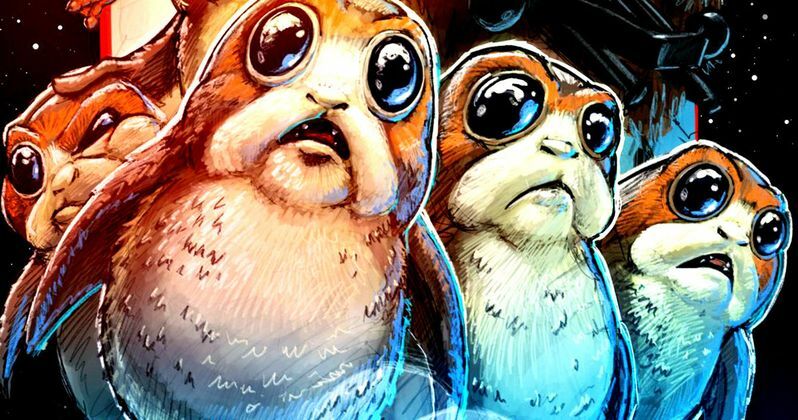 Once Star Wars: The Last Jedi actually comes out a lot of the Porg talk will probably be drowned out with some of the other big reveals that are sure to come in the next chapter of the Skywalker saga. The Star Wars fanbase is somewhat divided on Porgs. Some think that they are wonderful and can't get enough. Others are concerned that the Porgs can be for this new trilogy what the Gungans were for the prequels and what the Ewoks were for the original movies. Until we see them in action, which could very well happen in the next trailer, it's tough to say which way it will go. We'll have to wait and see for yourselves when Star Wars: The Last Jedi arrives in theaters on December 15.